For many of my students, beginning any new text is daunting, and Shakespeare’s works cause even more anxiety. Not only is the language a challenge, but so are the names of many characters. After all, how many Orsinos and Malvolios have you had in class? This activity is designed to help students make sense of who the characters are and how they are related to one another. Furthermore, not only does this activity help students delve into the play, but it also gives them a document that they can use as a reference as they continue their study of the play. Although I haven’t had the opportunity to use this activity with Twelfth Night, my 9th graders made a similar infographic using the characters from Romeo and Juliet. It not only helped them to sort the Montagues from the Capulets, but also made them think carefully about the position (both physically and metaphorically) of characters who did not easily fit into one family or another, such as Mercutio and Paris. Because I am always a little leery of mandating students to use technology that can be time consuming and more trouble than it’s worth, I also gave them the option of creating their infographic on paper or using another digital program. While some took me up on the offer, many chose to use easl.ly. Several students chose pictures of familiar celebrities and television characters whose personalities mimic traits of Shakespeare’s characters as their images. For example, Ryan Gosling was a popular choice for Romeo as my 15 year-old girls felt Gosling epitomized Romeo’s romantic, yet brooding nature. Others created color coded boxes for each character, using various shades to depict how entrenched a particular character was with each family. For example, while Benvolio may have been a bright red, someone like Mercutio may have been pink to show that although he hangs out with the Montagues, he’s not actually a Montague. A few students chose to use another Web 2.0 tool, bubbl.us to create the text of their infographic. However, this tool did not allow them include pictures. So after organizing the characters on bubbl.us, the students printed their creation and added their own images. Feel free to send me any thoughts, suggestions or ideas you might have on Twitter (@missdrutchas). Gillian Drutchas teaches English 9 and AP English at Marian High School, an all-girls, Catholic high school in Bloomfield Hills, Michigan. She received a B.A. in English and Psychology from Mount Holyoke College and an M.A. in Educational Studies from the University of Michigan. She is also a 2014 alumna of the Folger’s Teaching Shakespeare Institute. 451 Years Old—and Still Full of Life! Happy 451st, Will! Today is when people all over the world traditionally celebrate Shakespeare’s birthday, and we’re thrilled to bring you even more ideas for marking this occasion. 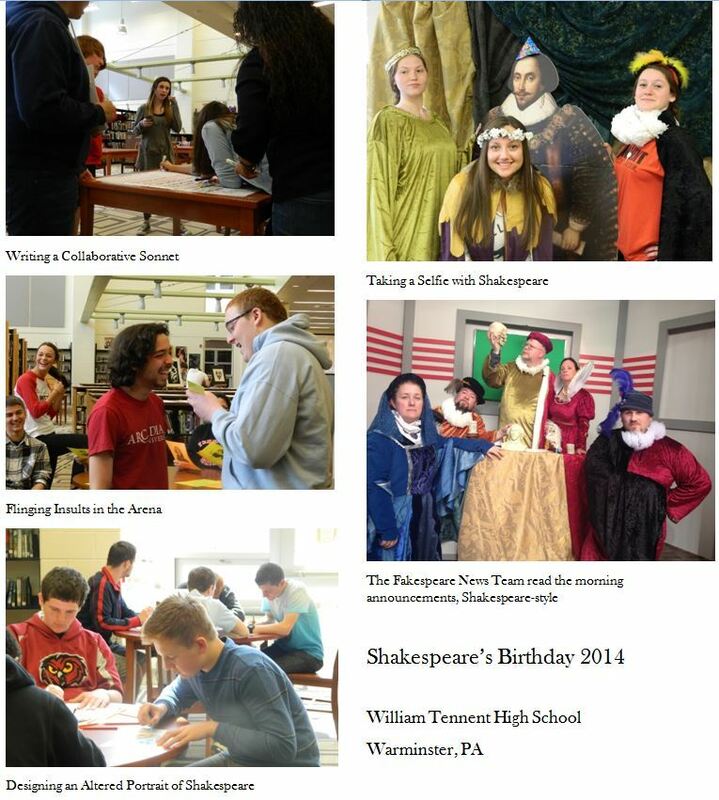 Thanks to all the teachers, students, librarians, and theater practitioners who shared their fabulous birthday plans. – DC Public Library debuted Uni, its first “pop-up reading room,” which brought dozens of volumes of Shakespeare and Shakespeareana to readers of all ages. 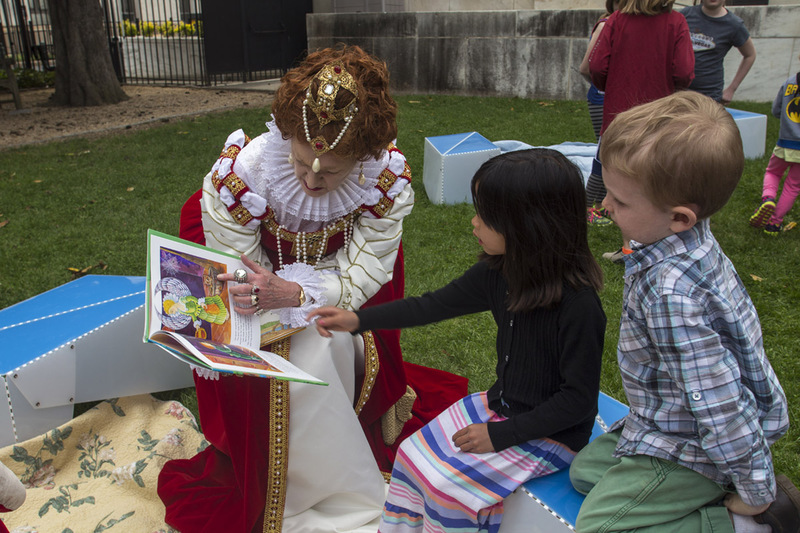 Families, students, teachers, and other visitors to our open house gathered on quilts and benches in the Elizabethan Garden to read all kinds of stories, scenes, and poems. Queen Elizabeth I (or a rather convincing 21st-century doppelganger) even showed up to tell a tale! – “Spontaneous Shakespeare”—an open-mic event for anyone interested in speaking Shakespeare on the Folger stage—drew dozens of enthusiastic participants, who read sonnets and unforgettable lines from Titus Andronicus, The Tempest, and many more plays. – Local students recited their original, award-winning sonnets in Folger Theatre, and Folger Library’s High School Fellows 2014 celebrated a reunion—and then pitched in to help with the big day. – Experts gave talks on conservation, scholarship, rare books, and the current exhibition. – Swordfighting, book-making, quill-writing, scavenger hunting, music-playing, juggling, portrait-drawing, and cake-cutting were just a few more of the ways we celebrated with hundreds of Shakespeare’s closest friends. We hope you’ll join us in DC next year, especially if it will be your first time! Thanks again, colleagues. Let’s party! Thanks to everyone who celebrated Shakespeare’s birthday with us on Sunday. Check back here on Thursday for a full report—and more birthday ideas from our teaching colleagues! In the meantime, enjoy these photos from Sunday’s celebration. Host a Shakespeare’s Birthday Read-a-Thon. 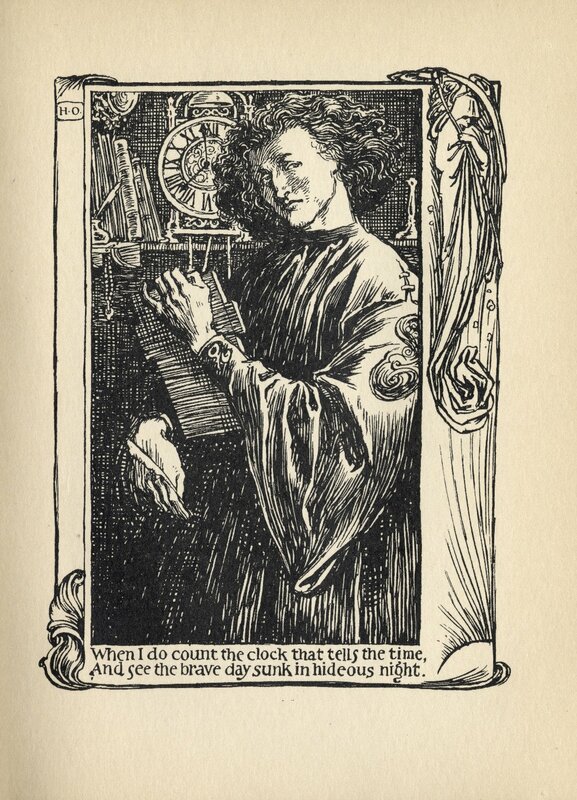 Take a cue from Jim Cody at Brookdale Community College in New Jersey and invite your school community to participate in a public reading of Shakespeare. We wish we could join Jim and his colleagues for this year’s villain-themed event! Have an all-out birthday fair in your school library or media center. This idea comes from Janemarie Cloutier, a school librarian in Pennsylvania, who took some Folger ideas and really ran with them. Janemarie says she “had the privilege of attending a Folger workshop in Philadelphia and was inspired to organize a celebration last year… and now this year. Many of the activities at our birthday celebration were modeled on Folger lessons.” Janemarie has even added new activities this year. From collaborative sonneteering and portrait painting to Shakespearean selfies and an insult arena, this library’s birthday bash really has it all. Check out these images from last year’s celebration. Play with costumes and performance. Melinda, who teaches in Colorado, sponsors a whimsical “Shakespeare Look Alike Contest” and enjoys seeing all those Elizabethan ruffs around school. We’ve also heard from teachers and students who dress as their favorite Shakespearean characters and even perform speeches by those characters throughout the day. BONUS: If you’re in DC this weekend, come to the Folger Shakespeare Library for our annual open house for Shakespeare’s birthday! Starting at noon on Sunday, April 19th, we’ll be pulling out all the stops and celebrating in a big way. Tour the Reading Rooms, see some swordfighting, perform some spontaneous Shakespeare, take a scavenger hunt, read stories with DC Public Library, and, of course, eat cake! It’s not too late to share your birthday plans with us! 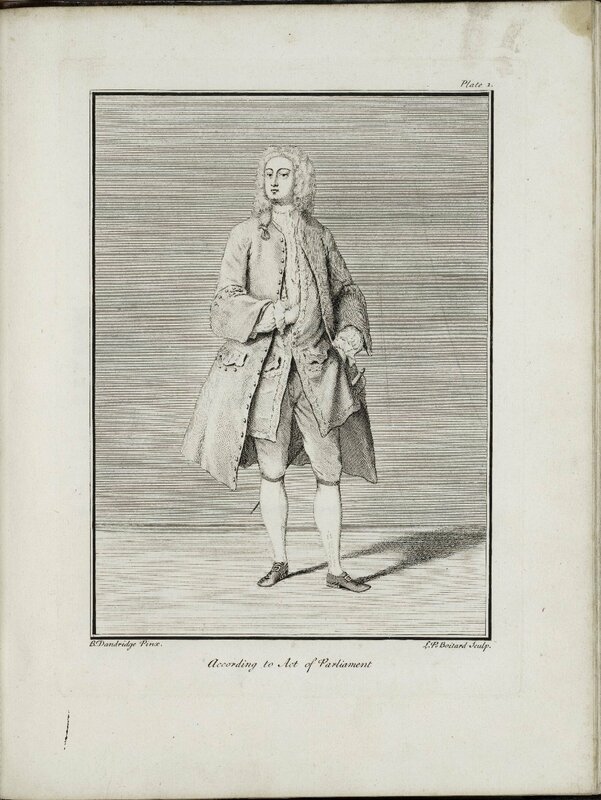 Please send your ideas for celebrating Shakespeare’s big day—along with any images—to Corinne (cviglietta@folger.edu). We’ll be posting some more of these festive contributions next week. Thanks, and enjoy! He’s right. I find myself turning to the Sonnets in times when I’m looking for a companion who seems to understand me before I myself do — and, let’s be honest: isn’t that why we love literature in the first place? When I with my students, I like to emphasize how “companionable,” to borrow a word from Yeats, poetry can be. The greatest lyric poetry feels like that friend you turn to who just “gets” you. There is no judgement but only unconditional love from a poem. I start there. Years ago, I remember watching Trevor Nunn working with David Suchet on what would later become the series, Playing Shakespeare. Nunn asked Suchet to perform Sonnet 138 as if it were Suchet’s part of the dialogue in an imagined scenario. I was riveted. Understanding Shakespeare for the stage was the object there, but I have found this approach to be a superb way of achieving all the objectives of close reading in and English classroom. Laurence Perrine would approve! With lyric poetry, we often feel that a person is right there speaking to us or, at least, to another person. A poem, in other words, gives us a character. And this is where you might begin, too. Let us look at Sonnet 18. Happy National Poetry Month! To celebrate, we share with you a special poem inspired by the poet Claudia Emerson’s visit to our very own Folger Shakespeare Library. It’s a beautiful meditation on the life of an author—not Shakespeare, but Emily Dickinson, whose belongings were on view as part of a special 2012 exhibit. We thank Martha Harris, a wonderful teacher and friend of the Folger, who happened upon this poem and shared it with us. We hope you enjoy it as much as we do. 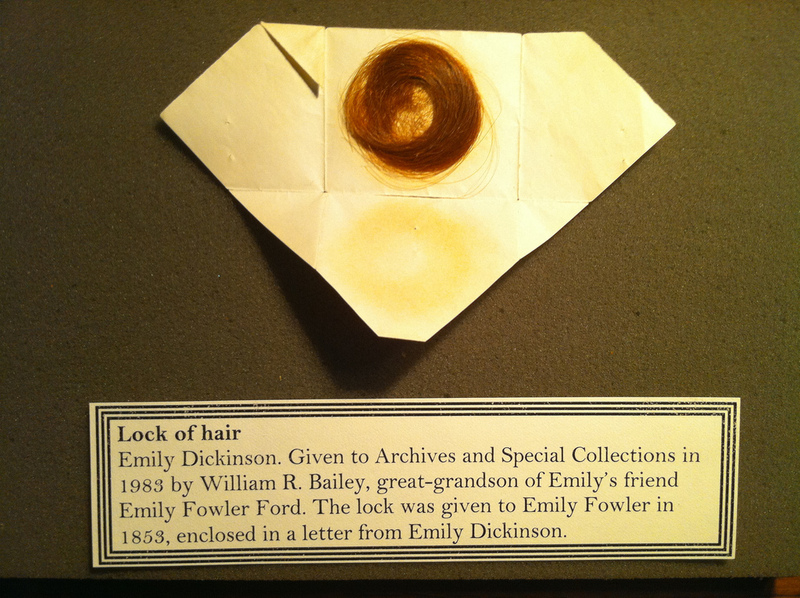 Lock of hair belonging to Emily Dickinson. Enclosed in a letter to Emily Fowler. Courtesy of Emily Dickinson Museum and Amherst College Special Collections. the hour of lead, at last, unlocked. You can read the rest of Claudia Emerson’s poem at Poetry Daily.